Now surrounded by a bustling town, the front facade of this 15th century tower house is neatly disguised within the square with a garden terrace. A walk around to the back of the castle shows its elevation on a steep bank overlooking the river Feale, above the location of a strategic ford. It also clearly shows that only two of the once four square towers and the northeast wall of the castle keep still stand - the keep and two towers are totally missing. 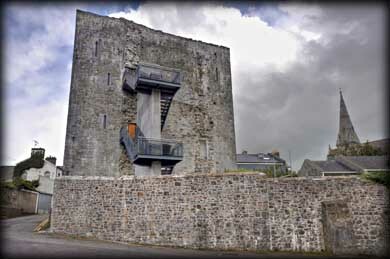 The four-story town-facing towers are joined by an unusual arch forming a continuous facade just below where the battlements would have been, very similar in design to Bunratty Castle. This facade is punctuated by small windows with inner splays. Most records give credit for construction to the Fitzmaurices. 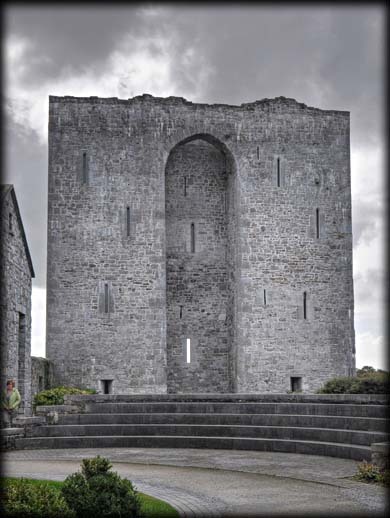 Listowel Castle is one of the best examples of Anglo-Norman architecture in Kerry. It is historically noteworthy because it was the last bastion against Queen Elizabeth 1 in the First Desmond Rebellion, falling only after 28 days of siege on 5 November 1600. In 2005 restoration was commenced by the OPW and an external staircase was added to the rear side so that tourists can reach tower rooms safely. Of course, we visited on a race day and the castle was closed. I can't tell you how often the literature says a castle the open daily, but somehow it is closed the day we visit, lol. Situated: Very easy, the castle is located on the square in the centre of town, just south of the N69. Discovery Map 63: Q 9890 3358. Last visit Sept 2012.